In considering the Church as “the home of the word”, attention must first be given to the sacred liturgy, for the liturgy is the privileged setting in which God speaks to us in the midst of our lives; he speaks today to his people, who hear and respond. Every liturgical action is by its very nature steeped in sacred Scripture. 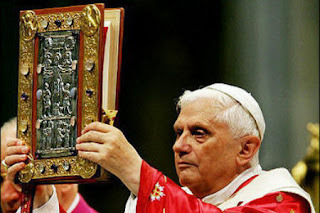 In the words of the Constitution Sacrosanctum Concilium, “sacred Scripture is of the greatest importance in the celebration of the liturgy. From it are taken the readings, which are explained in the homily and the psalms that are sung. From Scripture the petitions, prayers and liturgical hymns receive their inspiration and substance. From Scripture the liturgical actions and signs draw their meaning”. Even more, it must be said that Christ himself “is present in his word, since it is he who speaks when Scripture is read in Church”. Indeed, “the liturgical celebration becomes the continuing, complete and effective presentation of God’s word. The word of God, constantly proclaimed in the liturgy, is always a living and effective word through the power of the Holy Spirit. It expresses the Father’s love that never fails in its effectiveness towards us”. The Church has always realized that in the liturgical action the word of God is accompanied by the interior working of the Holy Spirit who makes it effective in the hearts of the faithful. Thanks to the Paraclete, “the word of God becomes the foundation of the liturgical celebration, and the rule and support of all our life. The working of the same Holy Spirit … brings home to each person individually every-thing that in the proclamation of the word of God is spoken for the good of the whole gathering. In strengthening the unity of all, the Holy Spirit at the same time fosters a diversity of gifts and furthers their multiform operation”. To understand the word of God, then, we need to appreciate and experience the essential meaning and value of the liturgical action. A faith-filled understanding of sacred Scripture must always refer back to the liturgy, in which the word of God is celebrated as a timely and living word: “In the liturgy the Church faithfully adheres to the way Christ himself read and explained the sacred Scriptures, beginning with his coming forth in the synagogue and urging all to search the Scriptures”. Here one sees the sage pedagogy of the Church, which proclaims and listens to sacred Scripture following the rhythm of the liturgical year. This expansion of God’s word in time takes place above all in the Eucharistic celebration and in the Liturgy of the Hours. At the centre of everything the paschal mystery shines forth, and around it radiate all the mysteries of Christ and the history of salvation which become sacramentally present: “By recalling in this way the mysteries of redemption, the Church opens up to the faithful the riches of the saving actions and the merits of her Lord, and makes them present to all times, allowing the faithful to enter into contact with them and to be filled with the grace of salvation”. For this reason I encourage the Church’s Pastors and all engaged in pastoral work to see that all the faithful learn to savour the deep meaning of the word of God which unfolds each year in the liturgy, revealing the fundamental mysteries of our faith. This is in turn the basis for a correct approach to sacred Scripture.